The Penta model, cast in magnesium, is a Marvic-houses classic. Thanks to the V- section spokes, well lightened and aerodynamic, it offers a unique design. Really a Must in terms of wheels. Even if it has been presented in the early 90s it has evolved itself in times and it is remained faithful to its original characteristics. 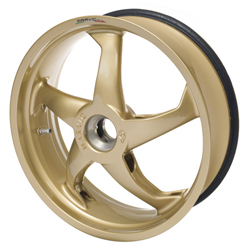 "...they made such a big difference that I will never use stock wheels again. I've had them about a year and I'm completely statisfied." Rear 5.50" x 17", 6.00" x 17", 6.25" x 17"
Marvic Gold, black, white, silver, titanium, Marlboro orange, red, blue. Other colors on request - please call. !onwards, gsx-r600, gsx-r750, gsx-r1000, gsx-r1300, 2000, 2001, 2002, 2003, 2004, 2005, 2006, 2007, 2008, 2009, 2010,2011, 2012, 2013, 2014, 2015, 2016, 00, 01,02, 03, 04, 05, 06, 07, 08, 09, 10, 11, 12, 13, 14, 15, 16! Please select17" x 5.50" 17" x 6.00" 17" x 6.25"